Candy Experiments: News Flash: Chocolate Cheerios contain "Real Chocolate!" 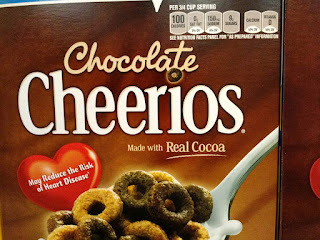 News Flash: Chocolate Cheerios contain "Real Chocolate!" These "Chocolate Cheerios" brag that they're made with "Real Cocoa." That's like bragging that zucchini bread contains zucchinis. (Of course, in this world of avocado-free "guacamole spread" and fruit-free "Fruit snacks," maybe you have to be obvious.